England's Mark Wood: In action at Headingley. The Durham paceman has been England’s quickest white-ball bowler for much of the past three years, able to summon a steepling bouncer and leave batsmen hopping when he bends his back, but has not always boasted figures to match. I’m not the same as them, they’re a lot bigger than me and I’m shorter and skiddier. But when they’re bowling quick how do they get their wickets? What kind of fields do they have? How do they get people out? It’s all about seeing how different people go about it. Wood goes into this month’s five-match one-day series, which begins in Dambulla tomorrow, with 34 wickets in 34 matches and a modest strike-rate of one every 51.2 deliveries. By contrast, new-ball partner Chris Woakes averages 33.5 balls per wicket, the absent Liam Plunkett sits at 30.4 and all-rounder Ben Stokes is operating at just under 40. The 28-year-old tackled the issue head on with bowling coach Chris Silverwood, who was similarly rapid in his own playing days with Yorkshire, and the pair have been casting a wide net in search of inspiration. “I said to him that although I’d played a few games for England I hadn’t taken loads of wickets. I’d taken one in a game, two in a game but I hadn’t had that five-wicket haul,” said Wood, who has a career-best return of 4-33 against Australia. “He got a hold of the analyst and we looked at bowlers like Kagiso Rabada (of South Africa) and Pat Cummins (of Australia). One change he has worked on is in his run-up, losing the idiosyncratic ‘back step’ and adding a few extra paces to his approach. “Off the short run, I was having to force it all the time, that meant I was putting more stress than I needed to on my body and having to ramp it up to get my top speed,” he explained. Although Wood would love to see early dividends by rattling through Sri Lanka’s top order over the next two weeks, he is realistic about the nature of a seam bowler’s job on the island. Given conditions, spells are likely to be short, pitches slow and swing in short supply after the first few overs. If the team require discipline more than dynamism, he is happy to oblige. “You’ve got to be careful that you don’t hunt for wickets here because you can quickly disappear if you are trying to get a wicket every ball,” he said. “All of a sudden there’s one too short, there’s one too wide... As a seam bowler here it’s almost the reverse of England where your spinners do the holding jobs and your seamers generally take the wickets. Wood played in a near full-strength team in England’s only completed warm-up match last week and is expected to line up tomorrow, with uncapped Warwickshire quick Olly Stone probably most vulnerable if Liam Dawson is selected as a third specialist spinner. England were able to train yesterday after sweltering heat replaced torrential rain in Dambulla. 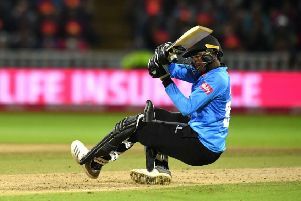 The tourists’ final warm-up match was abandoned without a ball being bowled after thunderstorms in Colombo and the players were kept indoors again after inclement conditions followed them to the forest region on Sunday. But the clouds had cleared by yesterday morning and the squad were able to get back into action, with middle practice and nets in soaring temperatures at the RDIS Stadium.